Today is Christmas, and although I am enjoying the holiday with family, there are many people who are not here, who I miss greatly. My son, Alex, lives a few hours away with his family, including his three little girls. I talked to them on the phone a little while ago, but it would be so much fun to be able to spend the holiday together! My mother, who left us eight years ago ... I miss her so much! This week I am supposed to receive news. I have no idea, no inclination, what it will be. But if it this bone is not you, if you are still alive, if you read these words, I just beg you please to make contact with me. You can do it anonymously by leaving messages on this blog if you are not comfortable revealing where you and and who you are with. I really just want to know that you are okay. So ... Merry Christmas, Michaela, wherever you are. Remember, I love you forever. For some reason I can't reply to Sharon's message itself due to a glitch that happens from time to time (not sure why) but I wanted to say that my thoughts are with you Sharon. Best wishes to you, Michaela and the rest of your family this holiday season. Merry Christmas Sharron. And Marry Christmas Michaela. Merry Christmas Michaela, Sharon, family and you friends. Any word on what day the tests comeback I'm dieing too know. Anonymous,your overwhelming need to know could be taken as insensitivity. This is not the sequel to a book or the next episode of Real Housewives. This is a little girl's life.And if the results come out one way or the other -it will change her mothers life. Do you understand that? Please exercise a bit more discretion and empathy. Thanks. McBride, thanks for trying to defend me, but I don't think it's at all insensitive of people to want to know the answer. People don't always use the words that best convey what they mean, and you can't hear their voices in writing, but I know that many people are on edge waiting for the results of this test, and the only reason is because they love Michaela. But, Anonymous, I have no idea when we will know. Our police department though we'd get the results two weeks ago, then one week ago, then this week, but it's already Thursday night and no news. It was said to be a process that takes four to six weeks, and my understanding is that this is the fifth week. I apologize, and I look at your blog every hour for news If Michaela Is found. 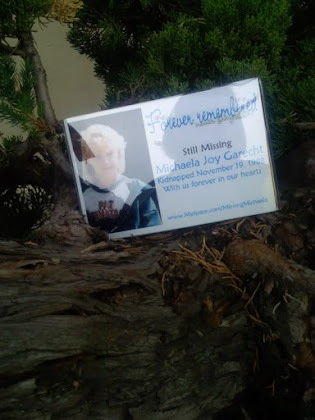 I still wonder about Michaela being found but I know that sometimes the best Is what we only dream about. Please keep Amanda "Nikki" Campbell and her family in your thoughts and prayers tomorrow (December 27). 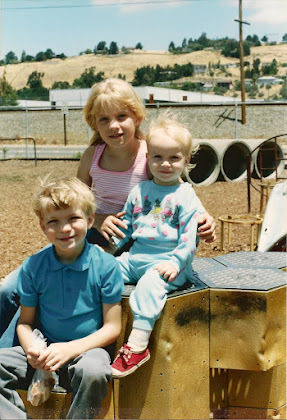 Nikki disappeared from Fairfield,California in 1991 at the age of 4. She was just doing what Michaela was - going about her day as any child should be able to. Keeping you in my prayers this week and always,Sharon. Yes, I am well aware of Nikki's case. I've met her mom and appeared on a couple of TV shows with her. It's a case that is often overlooked, so it's good of you to remember. Do you have an association with the family? No. I was at work one day and had some free time so I started looking at missingchildren.com or The Missing clearinghouse page and ran across her case. It caught me somehow and has stayed with me. You're right. Her case is not well known or publicized. And that's very sad to me. I have done some further research online but there's just not much about her. So I try to keep her name out there as much as I can. Thank you for posting this,Sharon. Hi Sharon, I wish you and your family had a great Christmas despite having to wait for the results. I was just reading the poem Michaela wrote that you have posted on the right column, it's remarkable...I don't know what to think about it. Did she like to write and had she written other poems aswell? Hoping your holiday was filled with the presence and warmth of Michaela. I read in an article somewhere once that the bone DNA does not match michaelas father. If this is the case, then it likely isn't her then right? I am so sorry for how long you've had to wait Sharon. I wish there was someone working there that would expedite it all for you since you've already waited for over 24 years. Blessings to you! Your information is incorrect. They were not able to obtain a full DNA panel from the bone. Does that mean they can't decipher if its Michaelas or not? No. It means they have to do mitochondrial DNA testing, which is more precise. Mitochondrial DNA comes only from mother to child, but that doesn't mean the dad's DNA doesn't exist. I read somewhere that the bone belongs to a girl age 5-14 around 1988-1989 and that theyre not that many missing girls around that time so it could be your daughhters, or Amber Swartz or Ilene Misheloff. Actually the original estimate was a child age 8 to 10. Then they broadened it to possibly include ages 5 to 13. The well was sealed in 1990, so it would have happened before then. There are many circumstances that point to the likelihood of this being Michaela, but the more time goes by the more doubt enters my mind. I think I feel really that it is impossible to solve the case. But also, minus the DNA, the investigation into the bone is so complex I think it leaves room for error. Do you know when the well was started? meaning when the well was to be full of dumped bodies? Not sure when it was begun, but I know Jo Ann Hobson was killed in 1985. I read somewhere that It's possible that they killed 18 year old Dena Viola McHan In Stockton In June 7, 1981 and It has became public because that woman was a relative of assembly woman Cathleen Galgiani. 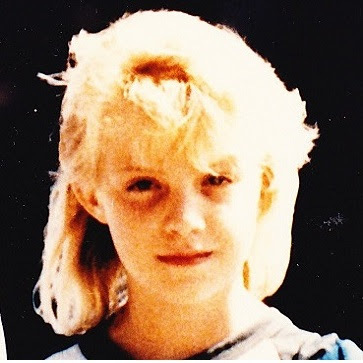 Kimberly Ann Billy was killed and dumped In the well where they found JoAnn Hobson In December 11, 1984. 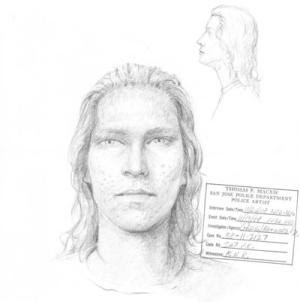 16 year old Ruth Ann Leamon went missing on the night August 19, 1982 from Modesto, Ca. Ruth Ann Leamon knew Loren Herzog and Wesley Shermantine and was seen by a friend In a local market with Both of them, and disappeared. It's possible that the well was used before 1981 and It used to belong to Wesley Shermantine's family. That information gives me alot more families to keep in my thoughts and prayers right now. I'm sure they are all very stressed waiting for these results as well. Thanks for sharing their childrens names with all of us. I believe these men are responsible for more than we may ever know, but each victim recovered is the end of one more families torture. Most are in southern California, and one is a parental abduction. The police department on Amber Swartz case has officially closed the case, but I personally don't think it has been solved yet. I agree with you,Sharon. I do not think the one who confessed to killing Amber Swartz is the one. Do you know the name of these cases? specially the parental abduction ? 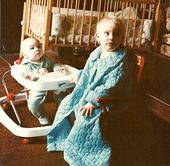 Sharon i wonder if Antreas Chester Cantrell 9, who was presumed to have drowned after a boating accident in 1988 Lake Shasta. I wonder if Tara Calico is in there as well. I didn't know them all, but they are easy to look up at the National Center database or other locations. I don't know what you mean by "in there"? This was a list that a reader posted. Do you mean are they in the DNA database? That I couldn't answer. If they don't get a name from the tests and the database, then I'm sure they will start looking farther, and at that point if anybody suggests any names I will pass them on. I personally, perhaps just because I don't know what I'm talking about, still leave a small room for doubt as to whether or not it is a child's bone. If I was 100 percent convinced it was a child's bone, I'd probably be 98 percent convinced it's likely to be Michaela's. As it is, I am more than 50 percent inclined to think it is, for a number of reasons. But hopefully we will find out ... well, one of these days. Oh, no. It's one of the big mysteries in my life, just what they took out of the well. San Joaquin Sheriff reports that they found the remains of three people and a fetus in the well, with one adult woman and the fetus remaining unidentified. However, this is obviously not the case, as we know from the bones intermingled with Jo Ann Hobson's. At this point nobody on earth knows exactly what they have there in San Joaquin. Jo Ann Hobson's family was allowed to see SOME of the property that was taken out. Apparently there were a lot of shoes. There are also other sites that Shermantine has pointed out which have not been excavated at all. Don't ask me why this is. It's another of the mysteries in this investigation. Like I said, the Sheriff in San Joaquin has lost sight of what this is all about, of the families who so desperately need to know what happened to their loved ones. He could have been a hero in this case. Instead, he seems to have chosen to be a roadblock to the answers we seek. And again, nobody knows why. Hello Sharon, just to clear up a few things. Jo Ann and Kimberly have been confirmed as the victims in the well, along with a fetus and a young black female. As we know there are a few more people who where in that well too. Kimberly came up missing before Jo Ann. We (my mom and I) where told Kimberly was the first person placed in the well but as we should all know by now the, sheriff's dept doesn't tell us everything. As for the land the well is on one of those guys family owned it. There is a possibility any one of the girls the other poster stated could be thier victims too. I sometimes feel people should read more about things before asking or saying things they don't have idea about. Michelle is Jo Ann Hobson's sister, so she probably knows more about all this than anyone except the sheriff ... and he's apparently not telling. Michelle and Sharon, you've both been through things that no one should ever have to experience. Sending you both strength. I wish I could say something to take away some of your pain. Anonymous I think the young black female Is Tony Clark and she was 2 months pregnant. Yes, that really is Michelle. She has commented on my blog periodically since the child's bone was found among her sister's remains. Last week I attended a meeting of Shermantine's victims, victim advocates, attorneys, a couple of friendly law enforcement agents, Senator Galgiani, and Jeff Rinek, retired FBI. The whole Shermantine/Herzog thing is pretty complicated, but I'm slowly getting up to speed on it. I was able to finally meet Michelle in person there, along with her mother Joan Shelley (who I have spoken to before), and her sister. Happy birthday, Sharon! I hope you have a wonderful birthday and a blessed new year. My thoughts are with you and your sweet Michaela as you continue to wait for news. Wow, thank you, Julia! How did you know it was my birthday? You mentioned your birthday last year in an entry to Michaela and I have a good memory. lol. Yes, you do! I wish I had a memory like that! Good morning Sharon, a happy belated birthday to you. I see someone ask about the fetus, it was at least 32 weeks. Today in the stockton record there's an article about those jerks. I think all of this is really getting to me! I know you're probably more on edge than me. Just know we keep you and your family in our thoughts. It was very nice to meet you and your daughter. I'm sure we'll see each other again. Have a happy New Year to everyone and take care. Thanks Michelle. Today is actually my birthday so you are not late. Your family is also in my thoughts. Here's to a resolution for all of us in 2013! It is pretty astounding that an eight months pregnant woman can remain unidentified, isn't it? 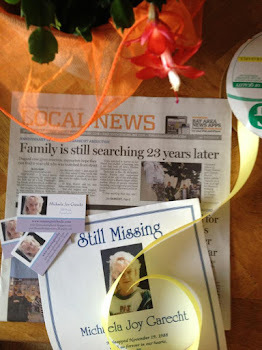 I've wondered if she was a street person with no real family ties, no one to really miss her or report her missing. Then as sick as the S.F.K. were, I have even wondered if possibly they had taken a woman, gotten her pregnant and held her somwhere for months, then killed her. I think there is possibly much to be known about them still. No offense,Danya. But I think that's a very low possibility. I'm not very versed on these monsters but from what I have read they would not have kept someone as they both had wives and children. They murdered for "sport" like hunting,as sick as it sounds. I'm quite glad I don't read much about them. I personally feel the pregnant woman was a runaway who was pregnant in the early months when she disappeared and then had the misfortune of becoming a victim. I hope she and all of the others are identified and brought home to their families. Happy birthday Sharon, I really hope 2013 will be much easier on you than 2012 was. I know you were having a stressful time. Happy Birthday, Happy New Year. I'm curious to know do former victims or victims families, politicians comment on your blog? i survived & i do, but i'm not sure if you'd include me as my case wasn't publicized or anything like that. Michelle, what do you mean when you say you survived? What did you survive, if you don't mind my asking. Sharon I'm not sure who this Michelle but it is not JoAnn's sister Michelle Loftis although we all are victims too by wes, loren and the sheriff's office. No I know it is not you. I have a lot of readers who have been victims in various ways, besides Herog and Shermantine. Happy Birthday,Sharon!! Wishing you a happy and blessed 2013. Sharon, wishing you, Michaela and the rest of your family happiness and peace in this New Year. I too just wanted to say happy birthday to you. I have commented on here before, but it has been a good while. I also just read the beautiful post you wrote about your mother on your other blog. So beautiful. 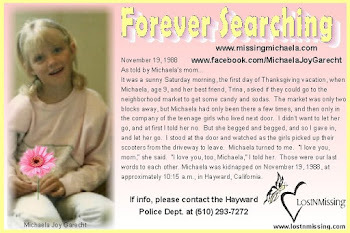 I have said this before, but I am about Michaela's age (just turned 33) and lived in Danville, CA at the time that Michaela was kidnapped. She and your family have been on my mind all of these years, and then a couple of years ago I decided to look her name up online and discovered your powerful blog. Please know that God has kept you all on my heart, and as often as He brings you to my mind, I continue to pray. Pray for her. Pray for you. Pray for your whole family. Lord, have mercy. I am praying for you continually this week. Thank you all for the birthday wishes. I appreciate it. Still nothing on the results? Just curious hoping it is not her!! Sharon, I have been following this case for many, many years. As it so happens, I now have a daughter who just turned 9 this past September, as well as a 6 year old boy. I am beyond over-protective of my children, because I know the evil that lurks in this place called earth. I am sometimes called "over-protective" by well meaning people who for some reason or another, are oblivious to the things that actually happen in real life, to real people, like you and your family. 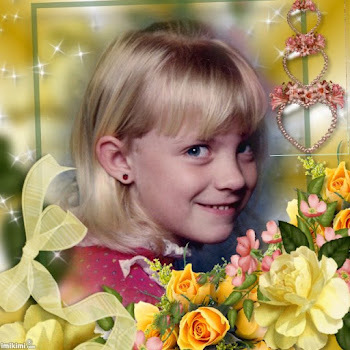 Your daughters case, as well as that of Amber Hagerman, have hit me the hardest.. and I often find myself fantasizing about getting the people that did these despicable things in a room, just me and them.. the things that I would do to them. I'm sorry, the pain that I feel just imagining what people like you go through is so incomprehensible, that I long to alleviate your suffering (though I know that that is not possible). Having said all of that, please forgive those of us, who are "dying" to know whether or not that bone fragment is that of your precious, precious angel. I look everyday, still, no news. I am so sorry for what has happened to you. Crime, to an extent, can be "understood", because we are flawed humans.. but crimes against children, I cannot even begin to comprehend. The word incomprehensible doesn't even come close. God Bless you Sharon. I think of your daughter often.